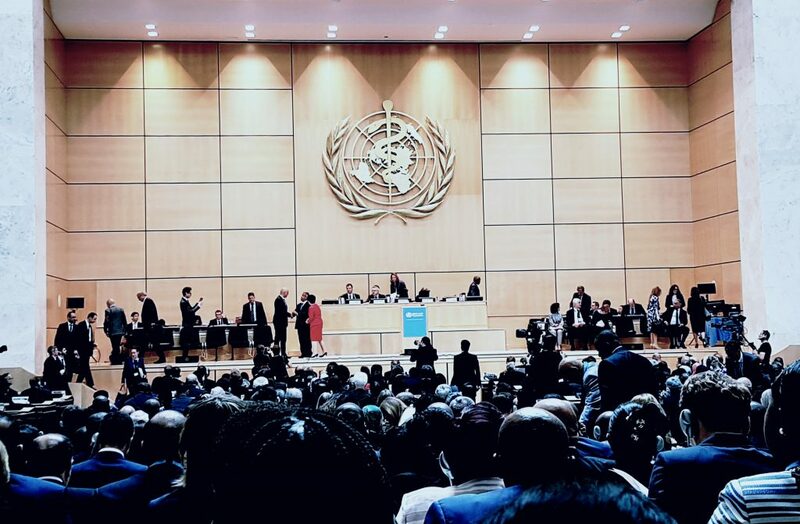 A view of the 70th World Health Assembly held in Geneva on 22-31 May 2017. Two years after the World Health Assembly adopted the Global Action Plan on Antimicrobial Resistance, there is significant but uneven progress with many countries still preparing their national plans. Developing countries also face problems of implementation, while stressing the need to hear their concerns about access to antibiotics and the need for a “delinkage” innovation model. The report below summarises the discussions on AMR held at the World Health Assembly. Two years after the World Health Assembly adopted the Global Action Plan (GAP) on Antimicrobial Resistance, many countries are grappling with the challenges of formulating and implementing national action plans based on the GAP framework. The national plans on antimicrobial resistance (AMR) were supposed to be ready by May 2017, or two years after the GAP’s adoption in May 2015, but almost half the countries have yet to submit them. A report on the progress of the global and national action plans was given by the WHO Secretariat at the World Health Assembly on 22-31 May in Geneva. No new decision was taken on AMR issues at the WHA. But there was a session in the WHA agenda during which many countries gave their views on various AMR issues. Among these were progress and challenges regarding the national action plans, the Development and Stewardship Framework on AMR that the WHA is scheduled to adopt to complement the GAP, and the Inter-agency Coordination Group (IACG) on AMR set up by the UN General Assembly and which has started functioning. Several developing countries, including Brazil and India, stressed the need to place access to affordable existing and new antibiotics and diagnostic tools as priority issues, as it was not enough to take action on the control and distribution of antibiotics. They also highlighted the need to use innovation models based on the “delinkage” principle, to ensure affordable medicines. These two issues of access and delinkage were prominent in the UNGA Declaration on AMR (adopted in September 2016) but were not given recognition in the Development and Stewardship Framework document, complained Brazil (see details below). The WHO’s progress report on the Global Action Plan two years after its adoption showed there is uneven progress at national level, as 67 countries had completed their National Action Plans (NAPs) and 62 were in the process of doing so. During the discussion at the AMR session, it became clear that there is a need to assess the designs of NAPs and prospects for implementation. It was clear from the interventions made by Member States that implementation of and operationalizing the NAPs is the biggest challenge. This is especially so for many developing countries that need technical and financial assistance. Discussion also took place on the Development and Stewardship Framework which is still being drawn up. WHO presented a report on several initiatives that have taken place and a road map, and asked for further guidance from countries. It was agreed that consultations would take place in the second part of 2017 to advance this framework. The third item that was discussed was the setting up of the Inter-agency Coordination Group (IACG) with many countries welcoming this step and looking forward to its work in the coming months. Regarding the Stewardship and Development Framework, Brazil emphasized the need to have intergovernmental consultations. It said the current draft does not provide enough attention to the elements emphasized in the UNGA Political Declaration on AMR, adopted in September 2016. Brazil mentioned in particular the need to address two issues — access and affordability of existing and new antibiotics and diagnostic tools, and the need to develop innovation models based on the principle of delinkage, both of which were prominent in the UNGA Declaration. India supported Brazil’s statement, adding that AMR has emerged as a major public health challenge and is rightly receiving increasing attention globally. India stressed that there should not be any imbalance in a Stewardship Framework that focuses only on controlling the production, distribution and sale of antibiotics. The framework also should focus on the equally important and interrelated issues of affordable access to new and existing antibiotics and diagnostics and research and development (based on models that enable access). India gave its support to all the three interconnected issues of antibiotic stewardship namely, R&D in new antibiotics, access to new and existing antibiotics and stewardship. It stressed this should be reflected in a balanced manner in any eventual global framework on AMR. The delineation of such a framework should be done through an intergovernmental process and not left to experts alone. India also noted that it has amended its drugs law and rules to better regulate the sale of antimicrobials and promote rational use of drugs. India also proposed to ensure the primacy of the WHO, FAO and OIE tripartite in any initiative, with WHO in the coordinator role. India also proposed to increase the Global Antimicrobial Resistance Surveillance System (GLASS) to include animal health, agriculture and environment besides monitoring of human health. India reiterated that adequate attention shall be given to the development and equity related aspects of AMR. There should be a clear focus on supporting member states in proper implementation of such plans through adequate technical support and mobilization of resources. Thailand noted that in the last two years there has been good progress made by the tripartite (WHO, FAO and OIE), development partners and Member States in addressing AMR. Thailand also welcomed the establishment of the IACG to strategically and effectively coordinate and move the UNGA Political Declaration on AMR forward. The Philippines also welcomed the IACG and noted that it will be pushing for AMR to be part of the ASEAN declaration and for the alignment of action between the ASEAN region and WHO efforts. Bahrain, on behalf of countries of the Eastern Mediterranean region, observed the need for a multi-sectoral response and need for more alignment. Bahrain called for working groups on AMR at national level. It called for the IACG to provide practical advice and coordinate the mobilizing of resources for NAPs. Algeria, on behalf of the African region, highlighted the urgency for a response to AMR and emphasized the critical needs of developing countries including access to high quality health products, vaccines, and diagnostic tools. Congo pointed out the heavy burden that AMR represents on hospital budgets, its limited resources to address this burden and how this impacts on its ability to implement national action plans. Kenya mentioned its commitment to mobilizing resources and working to increase awareness among public and health professionals as well as for collaboration with the veterinary sector. Kenya also called on WHO to support states technically and financially in development of and operationalizing the national plans. Ecuador highlighted the need to strengthen the health system and create healthy environments. It also emphasized the need for capacity building of human resources and to receive financial and technical assistance. Ecuador also pointed out that AMR is not only about medicines but that there is a need to work on the prevention and the factors that are causing the resistance. South Africa remarked that there is unequal access to antibiotics among countries and regions and that WHO should ensure equitable access to new vaccines and diagnostic tools. South Africa also noted that the implementation of the One Health approach faces challenges due to many conflicts of interest and this should be a factor to consider. Malta, on behalf of the European Union, stressed WHO’s role as the leader for the implementation of the national action plans. Malta welcomed the draft road map for the framework. Malta noted the importance of the IACG to provide guidance across the UN system for AMR issues. Malta asked for greater clarity in how the WHO Secretariat would engage with the IACG and mentioned the need for greater cooperation in research and development. It noted current EU programs on push and pull mechanisms for developing new antibiotics, the need for prudent and reasonable use of antibiotics and the importance to strengthen health systems with infection prevention and control efforts. Norway called for IACG to work closely with other UN agencies particularly on the environmental aspects of AMR. The USA noted the report of progress and emphasized the need to maintain prioritization of gram-negative bacteria. It supported the development of the stewardship framework and asked how it would be operationalized. The USA also called on WHO to develop guidelines of AMR in animal foods and increase surveillance and data collection. The United Kingdom spoke of the need to make the stewardship framework effective and efficient. The UK also noted that national action plans should drive the efforts of people on the ground. The Netherlands pointed out the tremendous progress in raising the political profile of AMR but it noted that many countries have not yet developed NAPs and that some countries have picked and chosen some elements and only focused on the easy sectors and not addressing others. Examples of the difficult issues were the use of antimicrobials as growth promoters in animals, waste management issues and prescription practices; the Netherlands said neglecting these issues should not happen. There was need to think about what would be presented in 2018, the need to work together and to ensure that AMR continues to be a priority. Germany pointed out its 2.2 million euros contribution to WHO and its support of the Global Antibiotic Research and Development Partnership (GARDP) and encouraged other countries to also step up support. It said AMR is a priority of its G20 presidency and emphasized also the need to ensure implementation of NAPs. Germany also mentioned key elements of the Berlin declaration such as: awareness, infection prevention and control, the sharing of data, need for new antibiotics, vaccines and diagnostics. Germany also pointed out the importance of affordable access to all patients in need and the criticality of addressing the environmental aspect of AMR. Germany welcomed the draft road map of the Development and Stewardship Framework, supported its approach and observed that it was essential that the framework address all areas and that member states should be involved closely in the development of the framework. In response to the country statements, Dr. Hajime Inoue, Senior Advisor to the WHO Director-General and Special Representative for Antimicrobial Resistance, recognized the strong commitments expressed by countries and the recognition about the substantial progress made. About the joint external evaluation, he assured countries that it would be a voluntary process and it will not be mandatory for the countries that do not wish to go through that process. He further commented that for countries that do not yet have a NAP, and countries that are behind schedule, that there is a need to support them. Dr. Inoue pointed out that countries that are still preparing their national plans will be invited to a workshop to support them in finishing their plans and that WHO is planning to announce a global training practice in collaboration with the Centers for Disease Control and Prevention (US). Dr. Inoue added that engagement with health care professionals is important and that they have been invited to consultations. Regarding guidelines for animal health, OIE and FAO have been fully involved and will continue to be. He also noted that WHO is working to make information available on prices and availability of antibiotics. The World Health Assembly took note of the Secretariat progress reports on AMR. Author: Mirza Alas is an Associate Researcher of the South Centre.